One Eternal Day: "If thou, Lord, shouldest mark iniquities..."
.... As a southern Presbyterian he was catechized on the Westminster Confession, which includes the clause: “This corruption of nature, during this life, does remain in those that are regenerated; and although it be, through Christ, pardoned, and mortified; yet both itself, and all the motions thereof, are truly and properly sin.” This is the concept of total depravity, the “T” of the famous TULIP of Calvinism. Such a concept should keep Christians sober and realistic about the potential for human reform efforts. For Wilson, it did not—except on race. When Wilson ran for president in 1912 he assured African-American leaders that he would pursue racial justice “in the spirit of the Christian religion,” indeed as a “Christian gentleman.” They believed him and campaigned for his election, this despite the fact that at the time most blacks were in the Republican Party, the party of Lincoln. 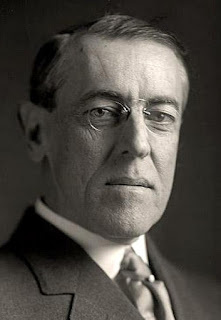 Once in office, Wilson brought into his administration many southerners who began to segregate agencies in the executive branch. Black leaders called Wilson to account. When they did, Wilson gave all manner of reasons why segregation was acceptable, including the implausible and paternalistic claim that it was good for African Americans themselves.